My heart aches tonight, as once again, life has been cut short for another loved and cherished member of our community. Meg Kays, a beautiful 22-year-old young woman, lost her life yesterday when she was struck by a truck while running on Airport Road in Grove City. This news came on the heels of the death of Shane McQuiston, a 15-year-old sophomore from New Wilmington, who died in a car accident this past Friday night on his way home from the basketball game. My son was at that game, but he made it home. The news of the accident in New Wilmington came all too soon after getting a phone call from my sister telling me of the tragic death of Jenna Prusia, 16, an 11th-grader from Kiski High school, who died as the result of a sledding accident while with her church youth group just a few days after Christmas. Jenna was a twin and was much-loved by her friends and family. To be honest, our community is still healing from the loss of Justin Griffin, a 15-year-old who was hit by a truck at the end of summer. So I have to ask why? Why is this all happening? I don’t believe that God is trying to hurt us, but I do believe that He is working very hard to get out attention. Does He have it yet? Our hope comes from the Lord alone. We are living in the end days. The signs are all around us. The situation with Israel, the choices made by our government officials, wars, floods, starvation, genocide, rampant sexual sin, terrorism, the knowledge explosion….. it is like the pages of Daniel and Revelation are unfolding and we are all in the cast. Bottom line…. time is short. In these cases, time was shorter than what seems fair from our perspective. I am positive that Meg, Shane, Jenna, and Justin all had no idea that their day would turn out like it did. None of us have any promise of tomorrow. We have no guarantee of even another hour. But I know for a fact that God is using these young people to draw others to himself. The gathering of the harvest has begun. Not only these ones that we know and love, but those 20 kindergarteners and their teachers and so many others like our loved ones. It is happening all over the place. God is moving in the hearts of young people. Jenna had written in her journal about how much she loved the Lord and how she was ready to do anything He needed her to do to help spread His good news. Her entire school and community were made aware of her love and passion for Jesus. Justin had just been on a missions trip where he decided that he really wanted to live for Jesus. I am sure that there are many other stories to tell from each one of these tragic losses. Romans 8:28 tells us, “And we know that in all things God works for the good of those who love him, who have been called according to His purpose.” I know in these hard days it seems almost cruel to say that any good could come from the loss of these dear loved ones. But looking through the eyes of faith, asking God for His perspective, we can see that the Lord is doing everything He can to get out attention. He is giving us one last chance to call on His name so that we may be saved. The harvesting is beginning and He is offering you eternal life if you will just call on His name, repent of your sins and trust Jesus as your savior, by surrendering your life into His hands and letting Him live through you. Does He have our attention? How many more wake-up calls do we need? In the same way, I want to yell out from this small and humble platform that the Lord has provided. Wake up! Wake up! How many more will it take for us to get the message. Time is short, the end is near. The harvest is ripe. This is the last call. We are living in the final pages of this side of history. Take notice and call on the name of Jesus. Take heed to the warning and repent and call on His name and receive the free gift of salvation that He has for you. Love one another. Love your kids like there will be no tomorrow. Love your spouse and stop fighting over unimportant details. It’s the end of the world as we know it, and we are so distracted with the stupidest things. Get your nose out of your computer and spend time with your family. Make time to spend with the Lord and ask Him to give you His perspective. Quit being so self-centered and self-absorbed and get your life right with Jesus. Finally, the Lord has called us to share the gospel with our circle of influence. We have to stop being so politically correct and share Jesus with those around us. It’s time that we stop being afraid. Time is short and there is only one way, Jesus. He is it. The scriptures say that the harvest is plentiful, but the laborers are few. It’s time to share the news with those we love. We cannot wait. IT IS URGENT!!!!! My heartfelt prayers go out to all of these families. Our love and sympathy are extended to you. May the peace of God that transcends all understanding guard your heart and your mind in Christ Jesus. Just as those who have given their lives in battle for the freedom of our country should and must be honored, may we give honor and respect to these dear ones who have allowed the Lord to use their lives for our spiritual freedom. 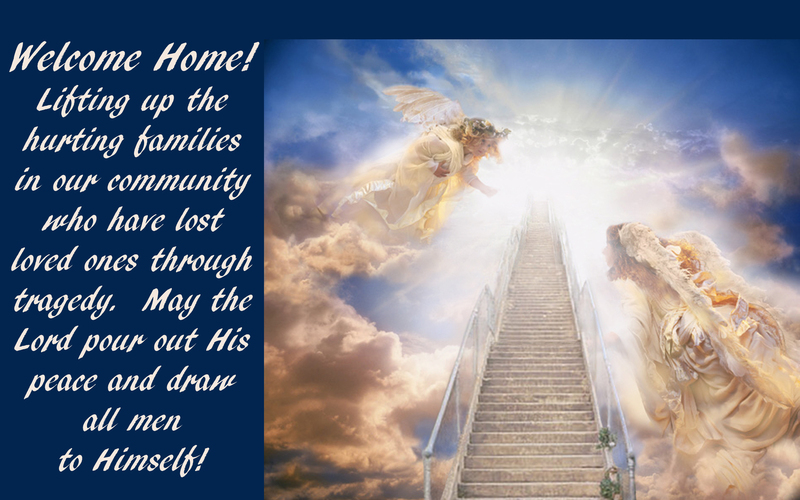 May there be a great and awesome harvest of new believers as a result of those lost so tragically. Dear ones, we will see you on the other side in just a few blinks of time. Tonight, if I am honest, it is not well with my soul. My heart aches for the hurting ones. I call on the Comforter to bring comfort. I am reminded of Horatio Spafford who lost all of his children at sea. Upon hearing the news of their loss, he penned these words. May they bring comfort to your hearts today. Powerful message of truth, thank you Cindy. Old hymns are second only to Scripture when trying to find words for a speechless heart, broken with hurt…..